Since it’s January and I’m still in the early stages of my be-healthy goal this year, I’d like to introduce you all to this recipe. It looks super fattening doesn’t it? Au contraire! 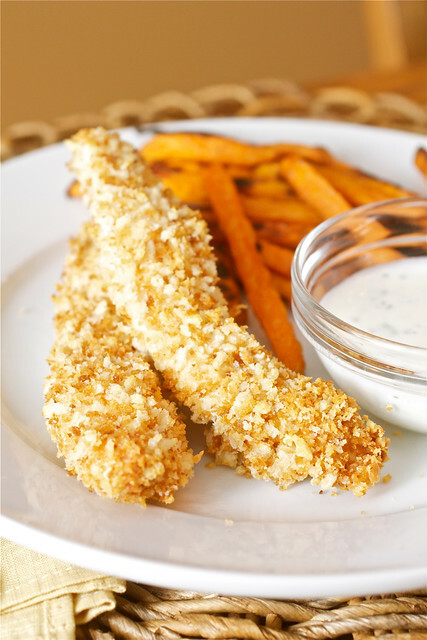 These baked panko chicken fingers are first dipped in beaten egg whites, lightly coated in toasted panko breadcrumbs (go for whole wheat if you can find them!) and then baked until the chicken is tender on the inside and perfectly crispy on the outside. Dipped in low-fat homemade ranch dressing and served alongside some baked sweet potato fries and a steamed vegetable, you’ll stop second guessing how difficult healthy eating can be! Preheat the oven to 475˚ F. In a large skillet, toss the panko with the oil. Toast over medium-high heat, stirring occasionally, until golden brown, about 8-10 minutes. Transfer the toasted crumbs to a shallow dish or pie plate. In a second shallow dish, whisk together the flour, garlic powder, salt, and cayenne pepper. In a bowl, whisk together the egg whites, water, mustard and thyme. Spray a wire rack lightly with cooking spray and place over a rimmed baking sheet. Working in batches, dredge a few pieces of the chicken in the flour, then the egg whites, and finally the breadcrumbs to coat, shaking off the excess between each step. Lay the coated pieces on the prepared wire rack and repeat with the remaining chicken. Spray the tops of the chicken pieces lightly with the cooking spray. Bake until the chicken is cooked through, 10-12 minutes. Serve warm. I always have a hard time getting the crumbs to stay stuck to the egg-white coated chicken. Tips? Erin: I find that a light coating in flour, the dip in the egg wash, then the coating in panko works really well and I’ve been doing it this way for years. The egg wash sticks to the flour and doesn’t run off the chicken – that’s what causes the panko to fall off. It also helps to lightly press the panko onto the chicken before moving to it the baking rack. Hope this helps! Tara, do you know where I could find the nutrition information for this recipe? Specifically calorie and fat content. Thanks! Georgia: There are websites (like Sparkpeople.com) where you can input the ingredients of a recipe and it will give you the nutrition information. Hope that helps! A new favorite in my house! I’ve been asked repeatedly to keep making these. Quick and easy meal, thank you!